I’m not exactly sure where September went. It was here, all crisp and vivid with Indian summer sunlight, and then the light softened and the air grew chill and it was October, a month squarely on the other side of summer. I spent September at work writing a holiday catalog, which may not sound particularly taxing, but is. Like, really. At night, after all the writing, I’d come home ravenous and addle-brained and stand in front of a refrigerator stocked with little more than a handful of fancy cheeses and—honestly—six kinds of homemade pickles. These are not the sort of ingredients with which one can reasonably cobble together the only meal of the day. Instead, I lived on tomatoes. (And wine. Lots and lots of wine.) There are a handful of things that I make for dinner when I can’t be bothered to figure out what to make for dinner, but this cherry tomato gratin is by far the best of my default dinners. 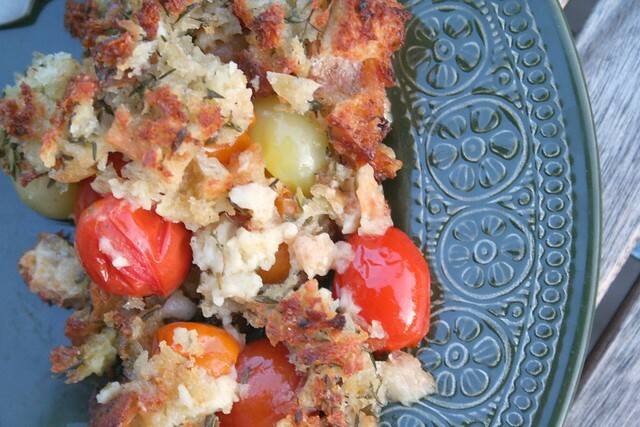 You toss a pint of cherry tomatoes in a shallow baking dish and scatter a handful of breadcrumbs, fresh herbs and Parmesan over them, leaving just a hint of round redness peeking out here and there. Then you slip the dish into a hot oven until the bread is crisp and golden and fragrant and the tomatoes have just begun to go all slumpy and warm. With each bite you get the hefty crunch of cheesy toasted bread, the vivacious freshness of summer herbs, and the exhilarating burst of intensely sweet roasted tomatoes. Which is exactly the sort of thing you need when you’re feeling all sapped and addle-brained and like whoever invented sentences is a real jerk. I don’t know if tomatoes are still in season where you live, but we have another week or so here along the 45th parallel. That’s at least five nights of cherry tomato gratin— spooned over thick slices of fresh mozzarella or grilled eggplant, tossed with capellini, or served alongside roast chicken. On the other few nights, I think we’ll just go back to September and serve it simply with wine. Lots and lots of wine. Preheat oven to 400°F. In a medium bowl, combine bread, Parmesan cheese, thyme, and garlic; drizzle with olive oil and toss to combine. Season with coarse salt and ground pepper. 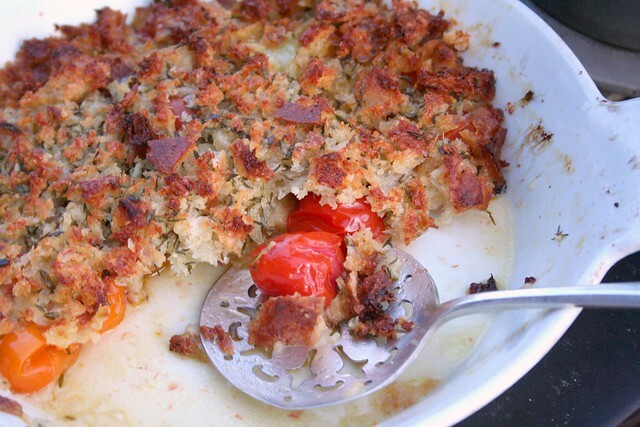 Place cherry tomatoes in a shallow baking dish; scatter bread crumb mixture over tomatoes. Cover baking dish tightly with foil and bake for five minutes. Remove foil and bake until crust is golden and crisp and tomatoes are soft, 10 minutes more. Serve over fresh mozzarella, grilled eggplant, pasta, grilled fish or roast chicken. This entry was posted on October 6, 2011 by Megan @ When Harry Met Salad. It was filed under fruits & vegetables and was tagged with cherry tomatoes, fall, gratin, recipe, summer. WOW, that looks totally delicious. I’m thinking of trying it this weekend on top of some grilled fish…any suggestions on what fish might be best with it? I think it would be really nice with light, flaky fish like cod or haddock or whitefish. Of course, those fish aren’t easy to grill because they tend to fall apart, so I usually set delicate filets skin side down on the grill and grill them without flipping until they’re done. Then I just lift the fish off the skin (the skin will stick to the grill grate) with a big spatula and let the skin burn off. I just found your blog! Predict I shall become an addict!! 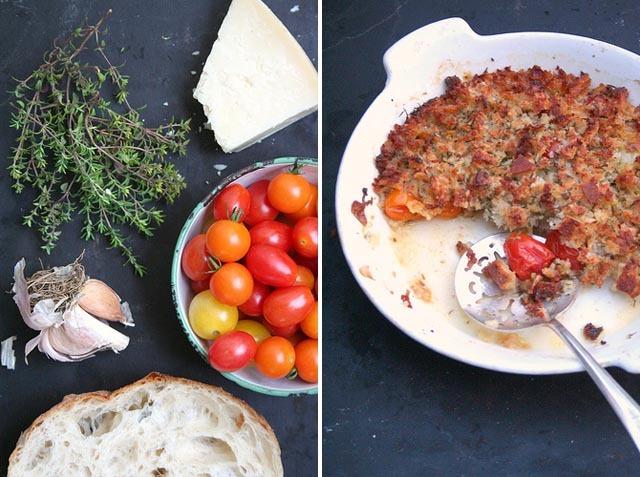 Off to make cherry tomato gratin right now. Welcome! I seem to have a lot of new visitors today, but my stat tracker isn’t working properly so I have no idea where everyone is coming from. Hope you enjoy the gratin! Oh, thanks! Did you have it with fish? And thanks for the link. That one only shows up in my WP stats with 13 visitors, but maybe because it’s within WordPress there’s a glitch. Oh, strange! I would’ve thought that was it. Might be a glitch, yeah. It looks delicious! I love tomatoes and never know what to make with them – besides the obvious spaghetti bolognese ofcourse. Thanks for sharing! OMG this looks so delicious! It’s definitely going on my “make next week list”. 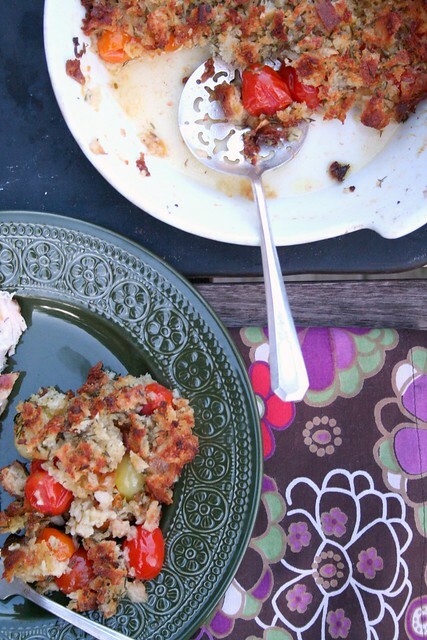 love your tomato gratin….simple and very nutritious…. Stumbled across your blog while looking for a recipe for butternut squash & goats cheese quiche and found this recipe, which I shall be trying verrrry soon. Your pictures are also beautifully taken and presented. Look forward to more posts soon! It was hard for me to find your articles in google search results. I found it on 12 spot, you have to build a lot of quality backlinks , it will help you to increase traffic.